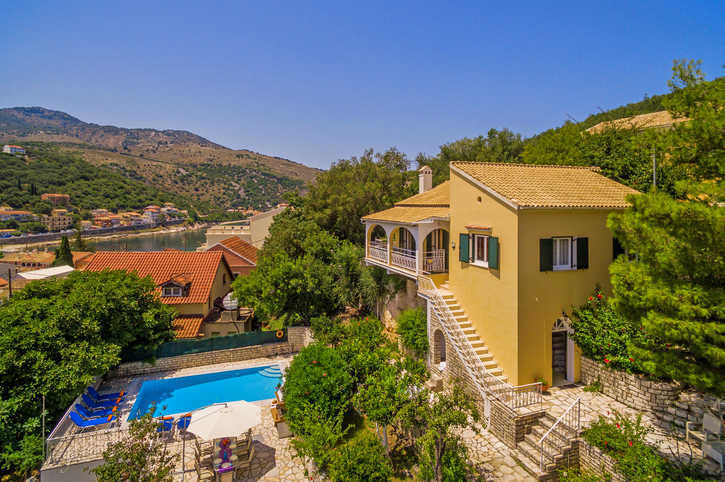 Villa Angela is in a fabulous position, right by the harbour in central Kassiopi. It only takes a few minutes to walk to its selection of waterside tavernas and shops, plus the nearest beach is also easily accessible on foot. This impressive 4 bedroom house has splendid views over the resort, and the harbour can just about be seen in the distance. The villa is traditional in design and includes air conditioning/heating in all bedrooms, WiFi and pool heating. The location is perfect - it only takes a few minutes to walk to the shops and tavernas at Kassiopi Harbour! The private swimming pool is surrounded by ample space to sunbathe. Plus, the adjacent sun terrace is bordered with colourful flowers and hedging creating the ideal spot to enjoy an alfresco meal, complemented by the brick BBQ. A smaller table and chairs can be found on the entrance terrace - perfect for a morning tea or coffee - and the games tables are great fun for all the family! As you approach Villa Angela, there's a private area to park your car, if you choose to hire one, just before the entrance to the villa grounds. The terraces are gated and steps on the right lead up to the front door on the first level. The L-shaped, open plan living space combines the lounge, dining area and well-equipped kitchen, which has several traditional features including an exposed beam ceiling and ornamental fireplace. Patio doors from here open onto a long terrace with views over the private pool to the resort beyond, you can even just make out Kassiopi Harbour in the distance. Directly off the lounge is a twin bedroom with an en suite shower room. There is also a second twin bedroom and a double bedroom sharing a separate bathroom along the hall. The remaining studio-style double bedroom is on the ground floor and is only accessible from the terrace as you first enter the grounds. This bedroom has a small kitchenette and dining area as well as an en suite shower room. This villa is registered and licenced by EOT Greek licensing association. This number is: 0829K122K7235000. Villa Angela is in a fantastic location, on a steep but short street, a few minutes' walk from the centre of Kassiopi. The harbour is lined with both traditional and modern restaurants with views across the water, plus many gift and beachwear shops. The area is overlooked by the remains of Kassiopi Castle, which is lit up in the evening as you dine. Kassiopi also has several small pebbly beaches, the nearest is around 5 minutes away on foot. Villas Xanthe and Moyria are along the same street. The road leading into the harbour has a few restaurants, with a greater choice of tavernas and lively bars around the waterfront. There is everything from contemporary eating places to traditional venues and popular bars with Greek dancing, karaoke and live sports! Kassiopi has a couple of small but pleasant pebbly beaches around the headland, ideal for sunbathing, swimming and snorkelling. Or, you can visit the longer shingle beach of Imerolia, stretching away from the resort to the west. Children will love paddling and snorkelling in the sea. You can also venture 20 minutes' drive west to the popular Hydropolis Waterpark in Acharavi. The larger Aqualand Waterpark is an hours' drive back towards Corfu Town. In the true spirit of Greece, motor boats can be hired locally to explore the stunning bays of Kouloura, Kalami and Agni along the North East Coast. Alternatively, visit the islands highest point, Mount Pantokrator, and admire the superb scenery. Or, why not explore the abandoned village of Old Perithia which, today, is being brought back to life as the abandoned houses are renovated and summer tavernas cater for visitors. Villa Angela is not available to book for season as it is sold out. Take a look here at the Corfu villas that are currently on sale. Really great, 2nd holiday with you and would book again for sure!